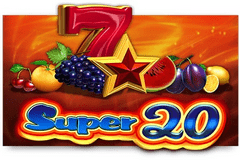 Fans of classic fruit machine style pokies will enjoy spinning up winning lines of traditional cherries, oranges and watermelons that are featured in EGT’s Super 20 video pokie. There’s 20 fixed paylines for them to line up across, in this 5-reel game where other symbols like red 7’s and stars will trigger some basic bonuses, although like all games from EGT, there is also the opportunity to play a double or nothing gamble game with wins of a certain amount or below, plus the chance to grab a progressive prize in the randomly-awarded Jackpot Cards round. Players don’t expect to find game features like free spins, multipliers or side games on old-school pokies like this, so it’s one that some will love while others won’t give it a second glance, but reliable payouts and ease of play are definite attractions for many. The low limit bet is 0.20 and wins are created in the conventional way by landing the same type of symbol across a payline on adjacent reels from the left side, while the more reels that it lands on, the bigger the rewards. Super 20 isn’t mobile-optimised however, so players will need to be at a desktop PC or laptop to enjoy it at its best. Before taking these fruity symbols for a spin, players may want to review the pay table, which lists what each combination will pay out as multiples of amount staked per line. From the bottom, there’s the cherries, lemons and an orange, each of which returns 10, 20 or 100x the line bet when stopping on 3, 4 or 5 reels of a payline. Plums and a juicy slice of watermelon are worth twice this amount, so paying out 20, 40 or 200x, while a bunch of grapes will pay 20, 80 or 400x the line bet. The bonus symbols are just as traditional as the fruit, and we have a red 7 that’s valued at 40, 400 or 1000x the line bet. This is also the wildcard of Super 20, able to substitute for anything other than the scatter symbol to help players complete more winning combinations. If there’s a gap in the sequence of matching symbols across a line, and the wild is able to fill that gap, then players will still get paid for a win, or it can stretch a line across extra reels for a higher payout. A star symbol, is the scatter, so it can appear in any positions, without needing to be on a payline, to be worth a prize, and the top payout of the game comes when 5 scatters appear at once, with a massive award of 10,000x the line bet paid out. Although there are no unique bonus features here, players can still take advantage of a couple of rounds that are carried across the whole EGT online casino games range. The gamble game can be played after any win of less than 700 coins and the Jackpot Cards feature, although rare, will guarantee that one of the progressive prizes displayed above the reels is won. If players opt to gamble a win, they will be shown a playing card rapidly switching from red to black and by correctly timing a click on the red or black buttons next to it, they double the triggering win. There’s the further option to try again, doubling the new amount, potentially until the gamble limit is reached, or the win can be collected at any time. But of course, it’s a gamble, and any wrong pick loses the initial win along with any gains made so far in the round. After any spin, whether it was a winner or not, players can be awarded the Jackpot Cards feature, which takes them to a new screen where they see 12 face-down playing cards. The object is to click them in any order to reveal the suits and once 3 of the same have been found, the related jackpot is won, ranging from the relatively small Club prize to the top valued Spade jackpot. Some people dismiss nostalgic pokies such as Super 20 without giving them a chance, but they would be missing out on games where the return to player percentage can be quite high. So it may not be an all-singing, all-dancing game, but it comes with some nice 3D graphics and the chance to win some substantial rewards, both in the normal run of play and particularly if the Jackpot Cards round is triggered. The minimum stake of 0.20 may put some people off, but free Super 20 video pokies are offered by many casinos for those who want to test it out or just play for fun.